Please note: Council’s Code of Meeting Practice permits the electronic recording and broadcast of the proceedings of meetings of the Council which are open to the public. Your attendance at this meeting is taken as consent to the possibility that your image and/or voice may be recorded and broadcast to the public. · To direct the development and implementation of the Revitalisation Strategy for the Nowra CBD and review as appropriate. · To determine overall capital works programs established by the Nowra CBD Revitalisation Strategy, as amended from time to time. · To identify and approve all expenditure of funds identified in the Nowra CBD Revitalisation Strategy, additional funds allocated by council for capital expenditure in the Nowra CBD including any loans, grants or from funds from any other source. · To act as a communication conduit between Council and the CBD stakeholders in respect to the Nowra CBD Revitalisation Strategy with appropriate support from council as required. · Assist council in advocating the adopted CBD Revitalisation Strategy to the community. · Provide a report to council each year outlining progress towards achieving the goals set out in the CBD Revitalisation Strategy together with any recommendations for updating the Revitalisation Strategy. · Consult with relevant stakeholders as needed. · To expend funds allocated to the CBD Nowra Revitalisation Strategy Committee by Council within the approved budget. · To establish sub Committees as deemed appropriate. · To promote the advantages of the CBD inside and outside the area, including making press releases and promoting the Nowra CBD Revitalisation Strategy project. · To raise funds other than rates and loans to fund the objectives of the Committee. 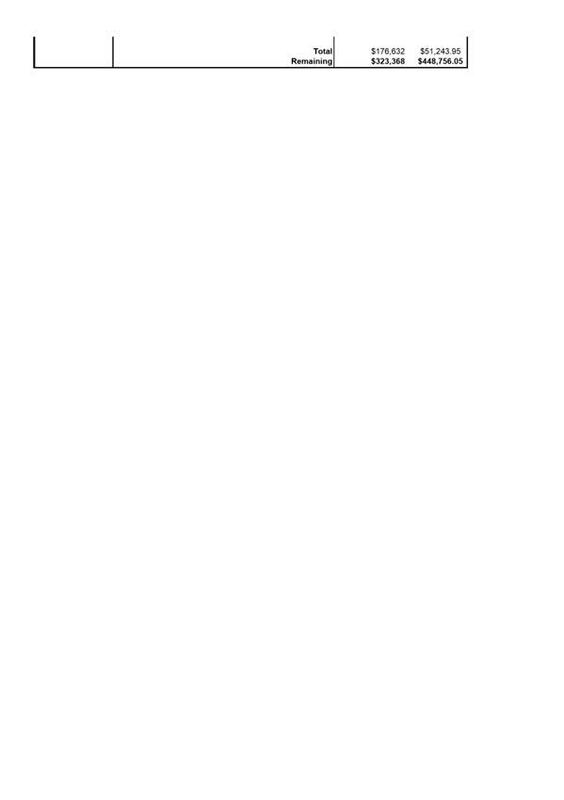 · To expend funds raised outside of Council as the Committee deems appropriate, e.g. promotions, entertainment etc. An apology was received from Luke Sikora, Clr Gash and Brendan Goddard. That the Minutes of the Nowra CBD Revitalisation Strategy Committee held on Wednesday 31 January 2018 be confirmed. Note: This item was brought forward for consideration. Developers are being questioned in relation to the variations in the works. Staff will take the feedback on board and happy to provide comments afterwards. Acknowledged, should have advised the Committee at the changes. That the Committee receive the report regarding the Worrigee Street Footpath Upgrade Variance from Design, for information. Russ Pigg addressed the meeting in relation to this report. It was advised that funding for this Committee currently runs out in June 2018. This resolution will ensure finding continues for the next 3 years and go through to the next election of Council being 2020/2021. The Committee requested a more detailed budget report in regard to recent infrastructure works. – Paul Keech to provide a more detailed breakdown of costs. Clr White suggested that the Budget be split up into the following areas: Promotions, Infrastructure and Council owned assets and for the budget to be controlled in one central place. The budget needs transparency and an ongoing detailed/itemised report. The Chair raised concerns regarding reimbursement of $1,600 for Christmas Promotions. The Committee held a discussion in relation to recent invoices that were requested to be paid. The Chairperson advised that funding from 2012 for the former Nowra CBD Promotions Committee was $177,000 and indexed each year and only had to provide balance sheets at the end of the financial year. That Council allocate a sum of $500,000 p.a. for the remaining term of the current council, (indexed annually to Rate Peg amount), to the Nowra CBD Revitalisation Strategy Committee to implement specific areas identified in the Nowra CBD Revitalisation Strategy. The Chairperson advised that there shouldn’t be any issue spending the funds as required provided that receipts are submitted within 7 working days. Scott Baxter suggested that funding for this Committee operate similar to the Promotions Committee and Sussex Inlet, where funds are paid directly to community groups. Clr White suggested that ongoing Promotions funding of $25,000 go to the Nowra CBD Business Chamber and is acquitted. If more funds are needed a report be submitted to the Committee seeking more funds. 1. 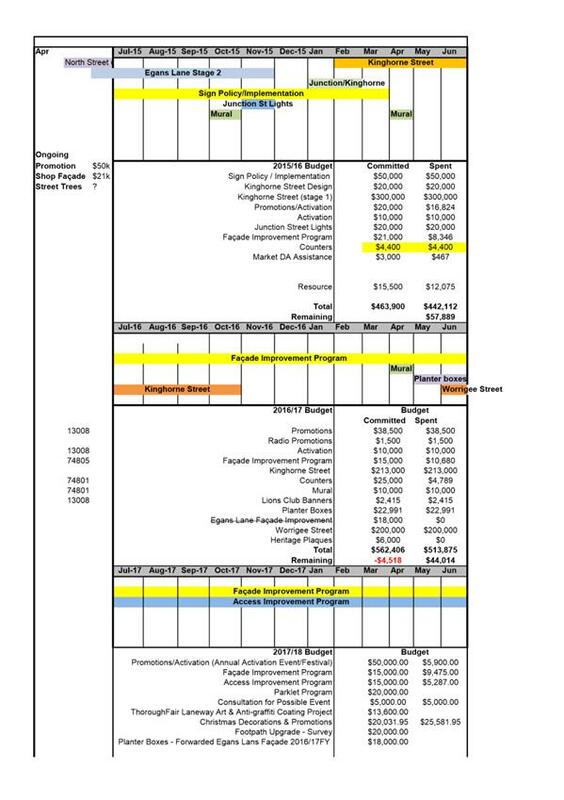 The Committee’s allocation of $50,000 p.a. for promotional events be reconfirmed. 2. The Chairperson be given authority to approve, on behalf of the Committee, all moneys spent on promotional events (including reimbursement of Committee Members) up to the annual budget outlined in Point 1. 3. The terms of reference for the Committee be amended to reflect the above provisions for promotional events. 4. The terms of reference for the Committee be amended to reflect the above provisions for promotional events. Wesley Hindmarch, member of the Australian Institute of Architects, provided a presentation in relation to his background and experience and working with Local Governments on similar revitalisation projects. Item dealt with earlier in the meeting. The Committee held a discussion in relation to the frequency of meetings. It was advised that in the Terms of Reference is states that “Meetings be held at least quarterly depending on demand”. Some members of the committee felt that in order to plan for events and holiday promotions monthly meetings are required. It was suggested that quarterly meetings remain and any additional information that is required could be forwarded electronically. Easter promotions for 2018 budget is around $1,400 maximum. The Celebration will be in Jelly Bean Park on Thursday 29 March at 3.00pm. Promotions budget will cover Music, PA, Tent, Advertisement in the Paper and Easter Eggs for children. It was advised that invoices/receipts will be required for reimbursement. That $1,400 be allocated from the Promotions Budget to cover the costs associated with Easter Promotions for 2018. The Chairperson raised concerns over the lack of power/electricity for past events/promotions (e.g. Christmas trees). He was advised by staff that they didn’t have enough power boards. That a report be submitted to the Committee in relation to switchboard power and itemised whether it should be a citywide cost or from the CBD Budget. Annie Aldous advised that there is a new McDonalds sign near the “Nowra” Sign at the intersection of the Princes Highway and Kinghorne Street, Nowra. Staff advised that to Council’s knowledge there has not been a Development Consent submitted. Gordon Clark will respond to the Committee with an update once he has had a chance to look into it. Jessica Volkanovski addressed the meeting and advised that at the last meeting the Committee resolved to support the Nowra Readers and Writers Festival by way of funding to the amount of $4,000. Regarding a possible winter event and the research carried out, a report regarding this has been submitted the Shoalhaven Tourism Advisory Group and they will be providing a response and if timely will coordinate this response into the next meeting update in April. Scott Baxter advised that a report was to be submitted back to the Committee in relation to options. Some of the Boxes will be funded privately. Diagrams of the locations were displayed on the screen and will be attached to the Minutes. That Committee accept and confirm the locations and placement of the planter boxes as outlined in the diagrams attached to the Minutes. Scott Baxter requested that investigations be done in relation to the flagpole raising system on the Highway. Staff advised that Ros Holmes has previously conducted an audit of which poles can accommodate the flag raising system. Staff will report back to the Committee accordingly. Wesley Hindmarch asked if the Nowra CBD Committee was making any submissions in relation the RMS proposed Nowra Bridge. Staff advised that the RMS report was released 2 weeks ago (see link below). A report is being submitted to Councils Strategy and Assets meeting in March. If the Committee feels the same way as the sentiments in the report the Committee they can consider making a submission to RMS. The Chairperson advised that Brendan Goddard still feels that the next footpath project should be the western side of Berry Street and how does the Committee and/or Council approach the land owners to contribute? Staff advised that as stated in the last meeting, that a report or update will come back to the Committee once the more detailed design work is completed. Staff advised that the Budget and Projects Update was tabled at the meeting and will also be sent out with the Minutes. There being no further business, the meeting concluded, the time being 6.07pm. The following report provides information and costs for the supply, delivery and installation of banners to Princes Highway, Nowra. That the Nowra CBD Revitalisation Strategy Committee Meeting receive the report for information. Along the western side of Princes Highway from the northern end of the Shoalhaven Bridge through to Worrigee Street intersection there are currently 58 Endeavour Energy poles with bannerettes (otherwise known as banner arms). These bannerettes have previously been used to hold banners. Any banner installation requires approvals by Endeavour Energy and RMS which is both lengthy and the outcome is not guaranteed. In addition there is the need for cherry pickers, traffic management and high level safety management. The cost of supply and installation of banners onto the bannerettes is approximately $25,000 per installation round. The banners last roughly 3 months due to wind, traffic pollution and solar exposure. If replacing banners on a three month rotation it would cost a minimum $100K per year. The committee may elect to install fewer Bannerconda® units, however it may affect the quoted price per unit. It is envisaged that Council would still need to apply to Endeavour Energy and RMS to replace the bannerette system with the Bannerconda system as a one off procedure. If approval is given and the work goes ahead there are options to replace the banners seasonally or to market an event or special milestone. The ongoing banner replacement would be 4 x $11,600 = $46,400 per year. Council currently does not have either an annual funding allowance or a policy to ensure continuity and effectiveness of banners in Nowra CBD. There is also potential to negotiate for additional funding from Tourism and Economic Development Sections. Note: Council has been advised that no commercial sponsorship is permitted on Endeavour Energy Poles. 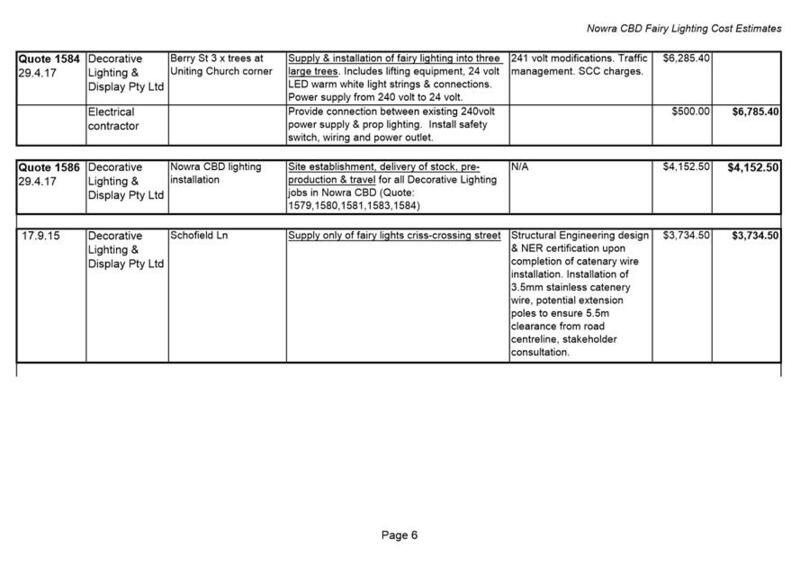 The following report is submitted to the Committee with costings obtained by decorative lighting contractors, structural engineers, welders and electricians to supply and install permanent Christmas lighting for Junction St and Berry St, Nowra. 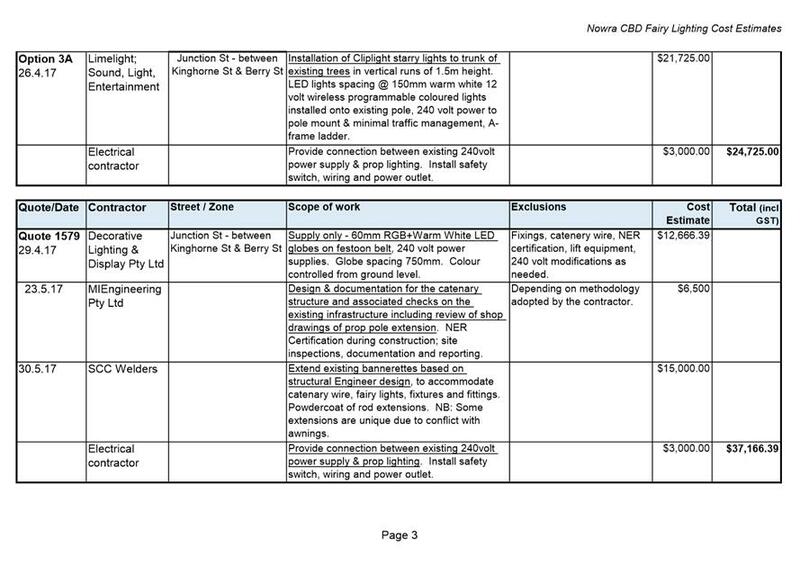 A breakdown of costings for various options such as fairy lights, coloured uplights or festoons and the necessary structural or electrical modifications required is attached. 1. The Committee receive the report for information. 2. 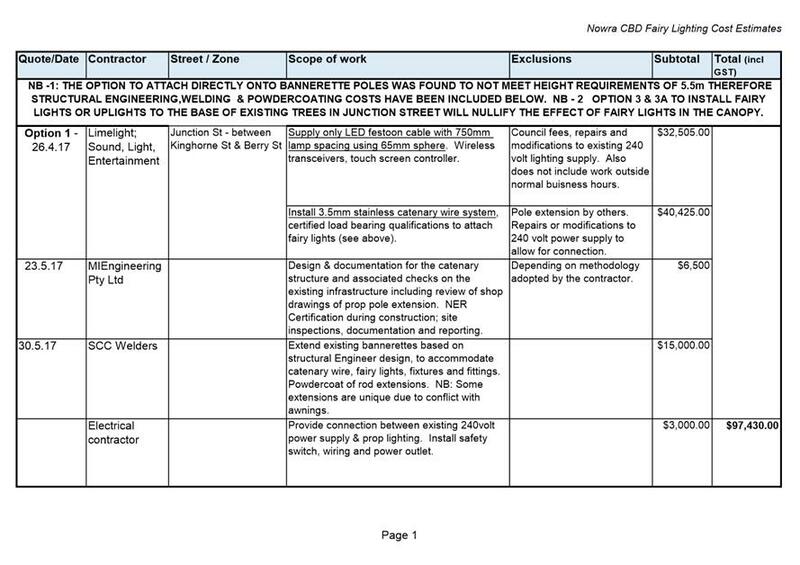 The Committee agree to fund fairy lighting of the two (2) fig trees in Berry Street. 3. The Committee not proceed with retro fitting Christmas Lighting to the remaining sections of Berry Street and Junction Street. The installation of overhead festoon lights and/or tree mounted fairy lights to Junction Street and Berry Street presents as a complex and challenging project as there are issues to be resolved in order to proceed with this work. In Junction Street the festoon lighting must provide a 5.5m clearance from the centreline of the carriageway below. To achieve this distance additional extension poles are required to be attached onto Council infrastructure (potentially lamp posts). These extension poles will allow a stainless steel 3.5mm catenary wire to be attached as a fixing point for festoon lighting proposed to criss-cross the street. It is proposed that the extension pole be designed and certified by structural engineers, who have advised that an assessment of the existing lamp posts must be undertaken prior to proceeding to detailed design. The extension pole issue is further complicated due to the fact that the overhead awnings protrude over the footpath in an irregular alignment, making the actual fixing more difficult. However, in terms of power supply in Junction Street, the existing lamp posts provide a 240 volt power outlet which can be accessed at minimal costs if the committee voted to proceed with any form of additional lighting. In Berry Street the issue of accessing power supply is problematic. The Endeavour Energy light poles which in 2016 were considered to be viable opportunity for power supply are no longer a workable option as Council are unlikely to be given approval for such works. Hence, the opinion of probable costs to draw from Endeavour Energy light poles which was provided to the committee is no longer included in the attachment. 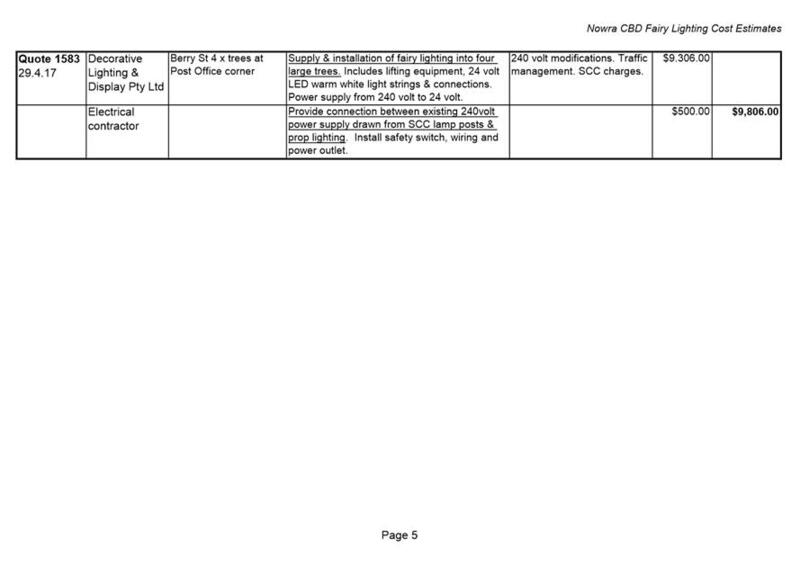 The option to provide fairy lights to trees in Berry Street is limited to the existing trees at Post Office and Uniting Church corner and the two large figs. In both these instances power can be drawn from either Council lamp posts or the library. Note: Due to the extent of existing pavement in this area the power cables must be swung overhead from lamp post to tree (approximately 5-6m) which will look unsightly. It must be noted that the attached costings are now up to 12 months old and need to be updated. Also Limelight have previously stated that they have provided numerous quotes which have not been acted upon and they do not wish to be involved in further quoting. The following report provides information regarding concerns over lack of electrical power for past events with specific regard to access to power boards. 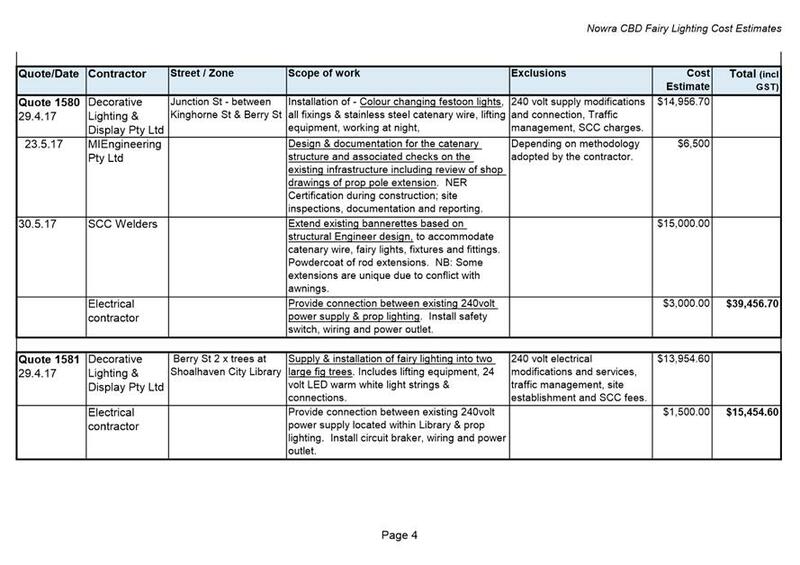 That Nowra CBD Revitalisation Strategy Committee receive the report regarding concerns over lack of electrical power for past events with specific regard to access to power boards for information. · Jelly Bean Park currently has two power boards located at the north eastern and north western extent of the main open area. Each locked power board has two 10A double power points (i.e. 4 leads can be plugged in) located inside. There are no power boards in the smaller section of park underneath the misting device sculpture. · Nowra Arts Centre / Gallery Walk currently has three 10A double power points (i.e. 6 leads can be plugged in) which are weather proof and located on the southern external wall of the Art Gallery. · Junction Street Mall currently has power located within each of the 8 x Bannerconda poles. The Economic Development Unit have also advised that they have not received any complaints of insufficient power outlets in the Nowra CBD. To provide the Committee the requested costings for the completion of the Worrigee Street Footpath Upgrade. That the report outlining the Worrigee Street Footpath Upgrade Costings be received for information. The project was funded by contributions from Nowra CBD Revitalisation Strategy Committee, and Shoalhaven City Council. The works were contracted to QMC Pty Ltd by tender. Construction commenced on 14 June 2017 and practical completion was reached 20 October 2017. 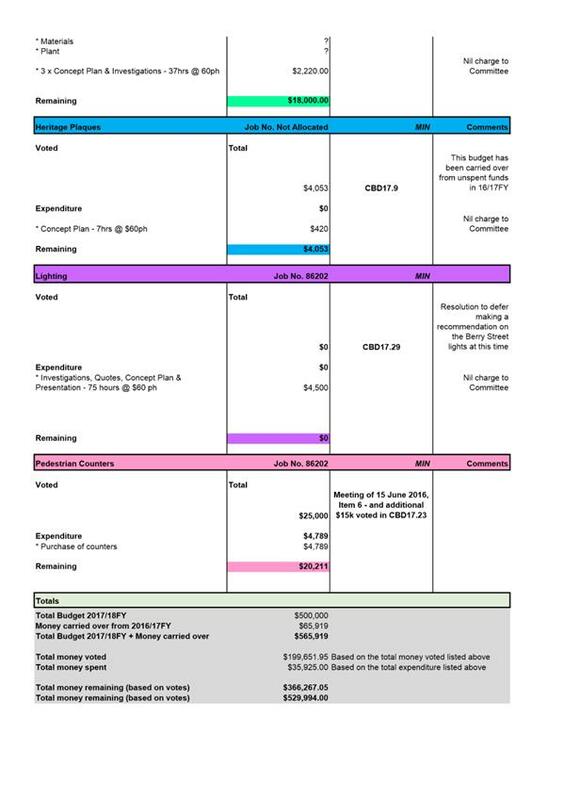 A breakdown of the costs is provided as Attachment 1 to the report. 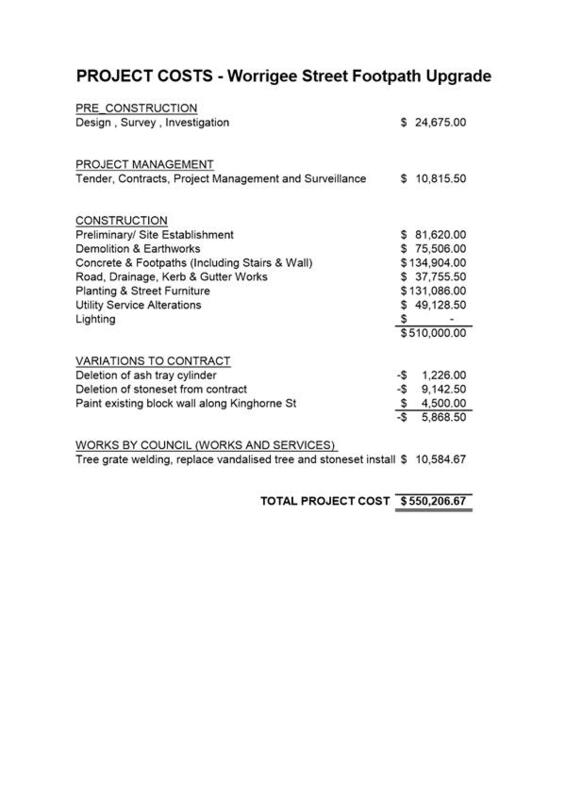 The total cost of the project was $550,206.67. The Nowra CBD Revitalisation Strategy Committee contributed $200,000 towards the project. The Worrigee Street project comprised of 325.4m2 of works, 204m2 (63%) being public area and 121.4m2 (37%) private area. It should be noted that the costs for the projects differ based on the design components of the footpath upgrade programs. In particular, the Worrigee Street upgrade included sloping site with cross falls; drainage pit replacement; Kerb and Gutter replacement with 1 metre edge to bitumen; paver header stones and soldier course, raised planters and furniture; and trees and extensive tree management system. Report back on options for proceeding with an annual winter event to support Nowra’s continued revitalisation in line with the report already prepared by ‘MyTravelResearch.Com’. That an Expression of Interest process be run to receive proposals from event organisers in accordance with the report on “Identifying the potential for a winter event to contribute to Nowra’s ongoing revitalisation” as prepared by MyTravelResearch.Com. At the Committee Meeting of 31 January 2018, the report on “Identifying the potential for a winter event to contribute to Nowra’s ongoing revitalisation” as prepared by MyTravelResearch.Com (project consultant) was accepted for information (CBD18.5). As part of the resolution, the Committee requested a further report that provided direction on possible next steps. 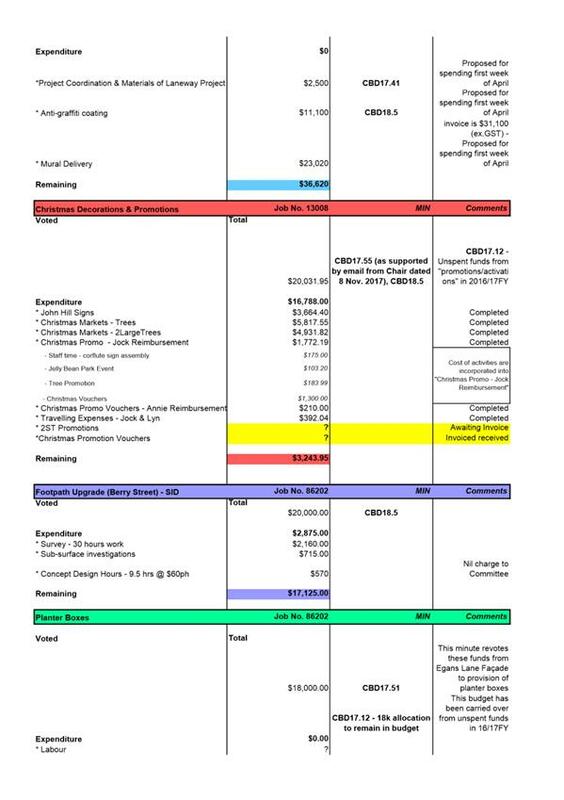 A copy of the project consultant’s report is provided at Attachment 1. Since initially reporting the matter to the Committee, the consultant’s report has also been reported to Shoalhaven Tourism Advisory Group (STAG) for information. There were no concerns raised by STAG during the meeting and no written feedback has been provided on the report. There were 195 individuals engaged through this research which represented local tourism providers, STAG, landowners, CBD business owners and general community members. - Response to research indicates willingness to attend an event in Nowra. In person, people were less willing to commit to attending. - Around a quarter of Australians attend regional events. Events with culture, arts, music and food offering the greatest potential to drive overnight visitation. Research indicated 62% of respondents were willing to attend such an event in Nowra (Note: half were from outside of the Region), with 80% open to a winter event. - Nowra has many assets to bring to support an event. Research indicated there was a significant brand challenge for Nowra, including with locals. Any event must acknowledge these but also use the event to challenge them. - Regional event audiences are inclined to attend multiple types (i.e. food, music, culture, etc.). Arts and culture events appeal more to females. - Strong social element is required for successful art and culture events. This will also encourage new audiences (i.e. younger visitors). - Variety of offerings is necessary and provides value for money which is important – a mix of free and paid elements work well together and is better than ‘discounted’ tickets. - Building on / partnering with the Chilli and Chocolate Festival might be appealing. - Successful events have different funding models, however one common link is that Council sponsorship is involved in them all at some level. This is a key indicator of community support. - Most events start short and only become longer as the event grows. The preferred length of the individuals engaged in the research is one (1) day. - Support from within Shoalhaven and wider South Coast is important. This provides opportunity for word-of-mouth advertisement for the event. However, locals themselves underestimate Nowra. - Digital assets / promotions are important and especially in the inception / early years of an event as it provides credibility. - Visitor Information Centres (VIC) are important for driving final numbers in destination. - Getting the basics of the event right is critical to its success and generating vital word of mouth in future years. For the initial event, access and transport are important, this is particularly an issue for regional events. - Proceed with organising an annual winter event based on the findings. - Council can start developing an event as there is sufficient demand for an arts or cultural event if it is likely to make a return on investment. - The event will need to be well and strongly executed and must have the objective of shifting perceptions of Nowra. - Consider using social media tools to promote the event to targeted audiences. - Design the event to include a strong social element to increase changes of people talking about it. - Design the event to incorporate music, live events and good food offering. It is important that there are some free elements included. - Consider building on / partnering with the Chilli Chocolate Festival. - Look at developing a long term commercial promoter, but continue to provide some level of funding. - Consider starting with a one-day event or one and a half day event. - Engage and involve the local community from the beginning to build excitement early. - Start planning digital assets / promotions early. - Ensure VIC staff are briefed in the early and ongoing promotions of the event. Utilise good signage for promotions. - Consider investing in additional transport for both in region and out of region visitors. The key findings and recommendations as outlined above conclude that there is a demand for an annual event in Nowra and provide insight into the viability / market for a potential annual event. This conclusion was based on research, investigation of relevant case studies and stakeholder engagement. Organising an event of this scale requires resources such as an Events Officer who would be responsible for organising and coordinating an event which is based on a great idea and would highlight Nowra CBD to a wide audience. Currently, Council do not have an in-house Events Officer who would ideally be responsible for this type of project. Council has however engaged fixed-term contractors to run events and this is what happened with the events around the recent Queens Baton Relay. - Provide a proposed event concept in Nowra CBD and thoughts on the design of the event and implementation. The event should build on the findings of the report Identifying the potential for a winter event to support Nowra’s revitalisation. - Identify the planned audience, expected participation numbers, potential benefits to Nowra CBD (i.e. increased expenditure in hospitality and retail) and proposed timing within the winter season. - Provide background of experience and capacity to stage and manage the event. - Identify any initial indication for sponsorship requirements. The EOI process would need to seek out innovative ideas based on the provision of a specific budget (for example, $50,000). After the expressions period is closed, submissions which best respond to the criteria may be shortlisted and invited to proceed to a more detailed submission on the proposed event. The successful event operator will own and run the event and be responsible for the profit and loss. Through the research undertaken, the project consultant engaged with specific stakeholders in the community during the industry and stakeholder workshop, semi-structured interviews and online survey. There were 195 individuals engaged through this research which represented local tourism providers, STAG, landowners, CBD business owners and general community members. A copy of the final report completed by the project consultant was provided to workshop attendees. In considering the potential for a future event, the Committee will need to allocate a portion of the budget to facilitate this. Currently, the Committee have allocated $50,000 of their budget towards promotions / activations which could be allocated towards the organisation of an annual event. However, it is noted that this money has previously been spent on Easter and Christmas promotions. Alternatively, a separate budget vote could be considered specifically for this item. Organising an annual event will require significant resources to ensure it is executed successfully. At present, Council does not have an “Events Officer” who is responsible for coordinating / organising events. Limited resources and time may result in an event of any kind failing. Going through an EOI process will enable the engagement of a suitably qualified event organiser who is experienced in running events of a similar nature, who will be able to successfully execute and run an event in Nowra CBD. Report back to the Committee on the formulation of a wayfinding strategy for visitors in the Nowra CBD. That the Committee receive a verbal update in relation to potential locations, options for design and costings for implementation of wayfinding signage in Nowra CBD. That a report be submitted to the Committee on the formulation of a “way finding” strategy (including costs to implement) for visitors to the Nowra CBD, including amongst other options, directory boards at logical locations (e.g. Stewart Place Bus Terminal, Junction Court and Jelly Bean Park). Wayfinding is the ability of people to navigate and spatially orient ourselves within spaces and from place to place. Wayfinding signage assists in the process of orientation and navigation through the use of map, directional and location information. Implementation of wayfinding signage in the Nowra CBD will provide pedestrians with on-street information to help connect visitors and locals with public transport, retail areas, public amenities, parks and historical walks. Additional information such as walking time can also assist pedestrians about distances they can travel by foot. Placement of any wayfinding signage will be determined by assessing key pedestrian / circulation routes and decision points within the Nowra CBD. Potential locations for wayfinding signage will be provided at the meeting. Options for design and costings for implementation of wayfinding signage will be provided at the meeting. To provide an update on Nowra CBD Revitalisation Strategy 2017/18 financial year budget and projects. That the Committee receive the Budget and Project updates report for information. 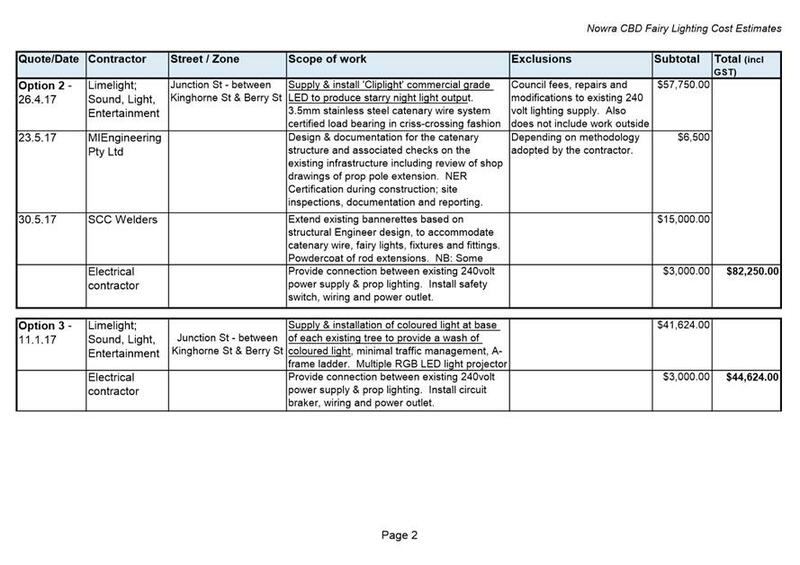 A copy of the Nowra CBD Revitalisation Strategy Budget is provided as Attachment 1. 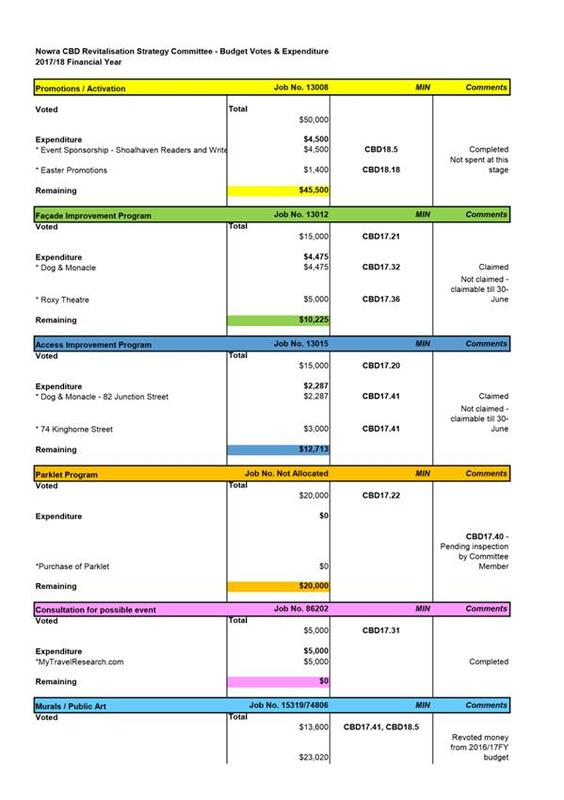 The budget reflects the recent vote of $1,400 towards Easter Promotions from the Promotions Budget. At the March Committee Meeting, it was expressed that a Balance Sheet would be useful to understand the expenditure against each of the budgets. A Balance Sheet for the 2017/18 financial year budget votes and expenditure was prepared and distributed to the Committee members on 28 March 2018. A copy of the Balance Sheet (as distributed) is provided as Attachment 2. Council staff are in the process of finalising an Agreement with the landowners of 130 Kinghorne Street (Quest) to deliver the next mural project in the CBD. The artist will be in Nowra from Wednesday 4 to Sunday 8 April undertaking the mural. There are revoted funds from previous financial years specifically for this project. Along with the mural, the repainting of panels in the ‘Thorough_Fair’ (lane adjacent to the Arts Centre) is intended to occur on Friday 6 April with a few local and returning (previously local) artists. Other works to be completed the following week starting 9 April include the anti-graffiti coating application to existing murals and installation of information placards. A verbal update will be given during the Committee meeting in relation to other Nowra CBD Revitalisation Strategy projects. Advise the Committee of Council’s resolution to continue the operation of the Nowra CBD Contributions Discount Subsidy Policy. That the Nowra CBD Revitalisation Strategy Committee receive this report for information. The Nowra CBD Contributions Discount Subsidy Policy is intended to encourage redevelopment within the Nowra CBD by providing a discount subsidy for the cost of car parking contributions for small to medium developments. A review was undertaken as to the effectiveness of the policy to assist in determining whether to retain it. That the Nowra CBD Revitalisation Strategy Committee supports the continuation of the Nowra CBD Contributions Discount Subsidy Policy. 2. Consider, as part of the 2018/2019 Budget, allocating an annual budget of $50,000 for the operation of the Nowra CBD Contributions Discount Subsidy Policy. Therefore, the Nowra CBD Contributions Discount Subsidy Policy will continue to be available on this basis and will be reviewed in line with other Council policies on a four (4) yearly basis. The Nowra CBD Business Chamber and the Shoalhaven Business Chamber have been notified of the retention of the policy. As part of the resolution, Council will consider providing an annual budget of $50,000 in the 2018/19 Budget for the operation of the policy.